Example of digital lines: one drawn cautiously and one that exhibits more fluidity. Fortunately, CLIP STUDIO PAINT has a few options to make this less of an issue. The first option, and likely the best in the long term, is to not be so cautious with your stroke. Instead of approaching it nervously, attack it head on in one fluid motion. This is more a fix on the user end than on the end of application, but here’s where CLIP STUDIO PAINT comes in. 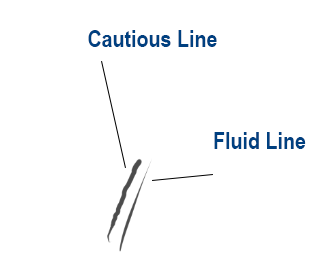 Each brush in CLIP STUDIO PAINT can have the option to assist with the Stabilization of the line, correcting the stroke as it’s being made. The user has control over the amount of stabilization from none (level 0) to full (level 15). This can greatly help improve the smoothness of your stroke without jeopardizing the look of the line. If that’s not powerful enough, some brushes also include a Post Correction option. This option corrects the line after it’s been drawn. The only downside to the Post Correction is that depending on the strength of correction, it can alter the look of your line dramatically. Both the Stabilization and Post Correction brush features can be found in the sub tool detail pallet under the “Correction” listing and can be activated for any brush you make. There you have it! 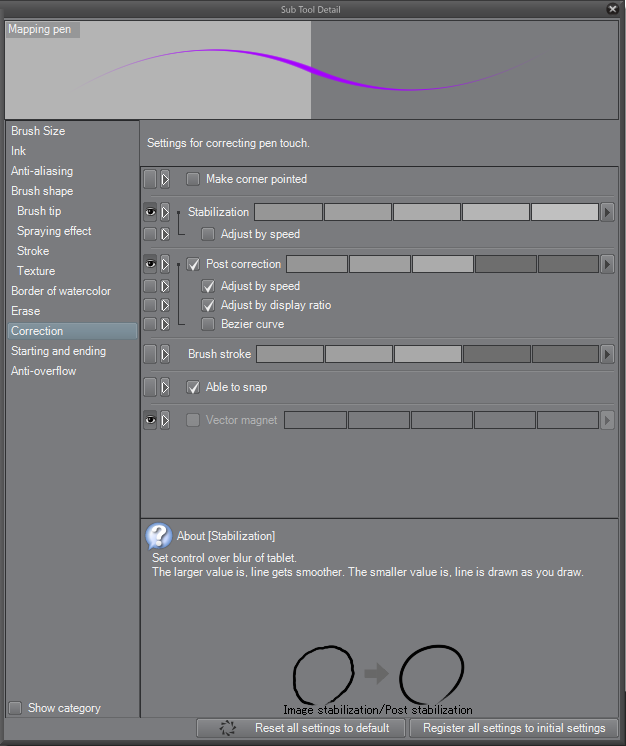 Sure fire ways to improve the quality of your stroke within CLIP STUDIO PAINT.